Berghain, the best club in the world. The last time I was in Berlin, I actually did not spend as much time out listening to music as I should have. I think I was turned off by the amount of US music on the German radio, and the prominence of international touring acts on the rosters of the most heavily advertised venues in the city, and hastily concluded that the music scene was not as interesting as art, performance, and theatre. Of course, Berlin is a global capital for music, that music being techno. And while I do enjoy all forms of electronic dance music (which I sometimes think is the closest thing to my music) I am now facing that fate that all aging ravers confront: do I have the stamina and enthusiasm to go to the break of dawn with the kids, especially without the kick of drugs to get me over the 2 AM hump? The Sunday soreness all over my body reminds me its not easy, but it is doable. Going along with younger friends helps, sort of like a training buddy (and that analogy reminds me that one of the most compelling reasons for continuing to subject my body to the nightclub is to forestall that other awful fate of the aging raver: having the space in your world allotted to dance music steadily diminish until its only remaining role is in the workout mix). But the myths are all untrue: it is possible to get into Berghain without a two hour wait at the door. You don’t need to be high to enjoy the music, although if you don’t dance you will quickly doze off. Cola and the occasional ice cream cone (which is sold inside Berghain, elegantly enough) will keep you reasonably fueled. And, most untrue of all: the music isn’t tuneless, repetitive, or thudding. Hours on end of four on the floor can indeed be remembered as such, perhaps. But its hard to imagine that they can be experienced as such in the moment, if you are really in that moment, and not distracted, wishing you were elsewhere. Minimal techno is indeed a powerful form of musical subtraction: minimal use of color, vocals, “warmth,” etc. But to further reduce this musical form to the parody of “thud thud thud,” — usually with a mock hand gesture to accompany it — misses out on the pathway that subtraction opens up to collective musical rapture. 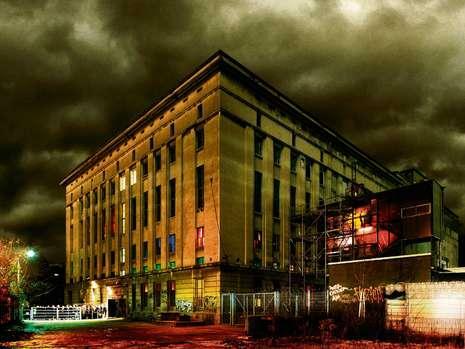 Perhaps the most cliché moment from a night at Berghain, or at any rate the most easily retold, is the moment, around five am, when the blinds in Panorama Bar are momentarily raised to let the morning light cut across the dance floor. “What fellowship can light have with darkness?” This moment seems to hold an answer, and I admit I was waiting for it, pacing myself, hoping to make it to that moment in order to be able to say I was there at the dawn, I made it through. And then I crashed into a cab and was in my grateful bed with a mask on, and slept until four in the afternoon. It’s always lovely to hear another account of partying in Berghain, especially from someone who can capture striking details and the broader affective atmosphere in the constrained space of an anecdote. I feel you about the marathon-like undertaking that is partying in Berlin (and *especially* in Berghain); of course, those experiences of ordeal and exertion are part of what makes these nights memorable. If you haven’t tried it already, I definitely recommend taking a disco-nap from 10pm to 6am, and then hitting Berghain early Sunday morning. Less of a line, you’ll arrive all fresh and full of a nutritious breakfast, and then you can stay dancing until late Sunday night without feeling completely destroyed. Things can get magical (or tragic, or absurd) when you stay late.